John Hattie's book Visible Learning for Teachers is an AWESOME researched based book/tool that helps encourage teachers to know their impact and how to increase learning for ALL students. The short video below focuses on the 8 mind frames of successful teachers. How Can We Create a Result Orientation and Foster Continuous Improvement? Why is a Results Orientation the Key to School Effectiveness? Why Should We Ensure Students Have Access to a Guaranteed and Viable Curriculum? Why Should We Implement Systematic Interventions? Why Should We Use Common Assessments? Why Should We Use Formative Assessments? Why Should We Use Teams as Our Basic Structure? Know thy impact! 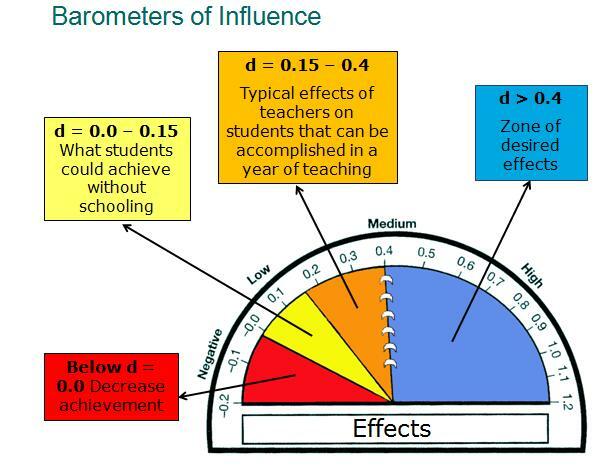 The Barometer of Influence below helps teachers to think about the impact they have on student achievement. Teachers, who are always striving for the greatest level of impact, can refer to this chart as a guide when considering their impact. Students who demonstrate normal growth will score d>0.4 on an influence effect calculator ﻿LINK﻿. High impact would be around d>0.75. Click this LINK to make your own copy of the rank ordered 150 influences on student learning.